Congratulations to Chris Lee, Event #29 Champion ($254,955)! Ship it to Chris "Genius28" Lee -- champion of Event #29: $2,500 10-Game Mix / Six Handed! Four days ago, Chris Lee was just one of many in the starting field of 431 players who was vying for a chance at a bracelet. 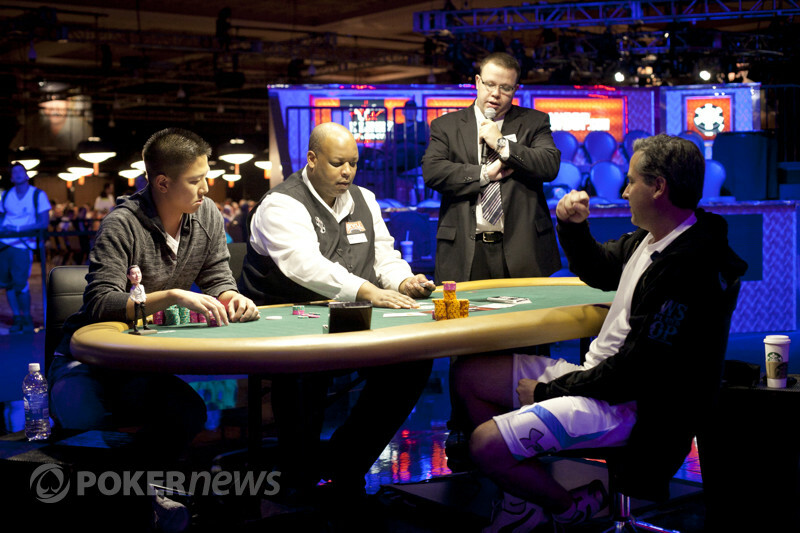 On the third day of play, Lee found himself at the final table and closer than ever. He was able to battle his way to the chip lead and take that lead into the extra Day 4 against Travis Pearson and Brian Haveson. On the second hand of the day, Lee eliminated Pearson by winning a flip in the round of No-Limit Hold'em. By doing so, Lee had an even larger lead against Haveson when heads-up play began and steadily applied the pressure from there. Haveson was able to find a few double ups here and then, but could never string them together. He'd double up, get short again, and then find another way to double. Finally though, Lee was able to hold up and end the tournament in a hand of 2-7 Triple Draw. On the final hand, Lee's ten-nine was able to eliminate Haveson as he drew a king on the final draw. Haveson earned nearly $160,000 for his finish, but it's Lee taking home the $254,955 first-place prize and the coveted World Series of Poker gold bracelet! 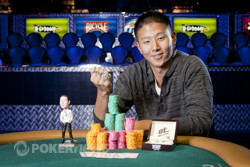 Chris Lee Takes the Bracelet! Brian Haveson was all in after the second draw and Chris Lee made the call. Haveson opted to draw one and Lee stood pat. The hands were tabled and Haveson saw what he was up against. Haveson was all in and drawing to a ten, nine, six, four or three. The dealer slid him his last card face down and Haveson peeled it slowly. He revelaed a , which was no good. Lee's ten-nine was good and he was able to eliminate Haveson and win the tournament. 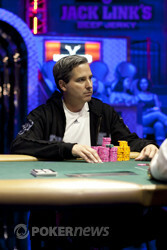 Haveson earned himself $157,491 for his finish in second place. Chris Lee called from the button and Brian Haveson checked in the big blind. The flop came down and both players checked. The turn added a second flush draw and paired the board with the . After Haveson checked, Lee fired 40,000. Haveson folded face up and Lee won the pot. Brian Haveson limped in from the button and Chris Lee checked his option in the big blind to see the flop. Lee checked and Haveson bet 34,000. Lee made the call. The turn was the and Lee had checked in the dark. Haveson checked behind. The river was the and both players checked. Lee tabled the and Haveson mucked his hand. Brian Haveson Doubling his stack, again. Brian Haveson just won't go away like Chris Lee hopes he would. He just doubled again and is back to about 600,000. Haveson checked in the big blind after Lee limped on the button. The flop came down and Haveson bet. Lee raised and the two eventually got all the money in after raising back and forth. Haveson held the and was up against the for Lee. The turn was the to give Haveson a flush and the river completed the board with the . Haveson won the pot with his flush and doubled up. Chris Lee raised from the button and Brian Haveson called from the big blind to see the flop. Haveson bet and Lee made the call. The turn was the and Haveson check-called a bet from Lee before the dealer placed the out on the river. Haveson checked and Lee bet. Haveson folded. On the very next hand, Haveson raised from the button and Lee called to see the flop. Lee checked-raised Haveson's bet and won the hand. Brian Haveson was all in pre-draw against his opponent Chris Lee. Lee stood pat and Haveson drew one. At that point, Lee said, "I have a jack," which means he had a jack low. Haveson was drawing to beat it. Haveson peeled his cards and sprung up, "Ten!" before tabling the . Lee mucked and Haveson doubled up. Chris Lee raised from the button and Brian Haveson reraised from the big blind. Lee made the call. Before the flop, Haveson slid all of his chips into the middle. He had 74,000 and could only legally bet 60,000. The flop came down and Lee raised to put Haveson all in. Haveson called. The turn was the and the river the to allow Haveson to double up.